It's back by popular demand! 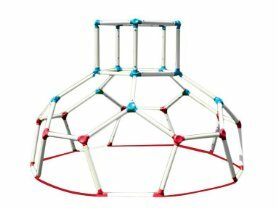 This Lil' Monkey Dome Climber for $89.99 (Retail $129.99)! The Lil' Monkey Climber Dome has plenty of room to climb all over, hang off, swing and can also be used for indoors role-play or as a den when covered with a sheet or two. It interacts with an augmented reality state-of-the-art mobile app. -Easily transportable between indoors and outside. -FREE mobile app! App cleverly detects the location of the child and the Dome. When the child moves around the Dome, the App will identify the location of the child and will reveal a virtual world of fun! A Lil' Monkey character will appear and instruct the child to feed him with fruits, discover treasures and win points. The player gets points by completing objectives as quick as possible. The quicker the child, the better chance to win those points! -Improves motor and cognitive skills.